Are your diapers stinky? Do they feel weird? How many diapers do you have– yep, the age old question, the fewer diapers you have the more often you will strip, the more you have the less often you will strip. Why? The detergent you use can build up on the diapers, the more changes each diaper has been through, the more ammonia it may hold. Now my diapers smell, I’m not sure why, based on things I’ve read they probably should, because I don’t soak them or anything. Your detergent is different. There are sooooo many laundry detergents for cloth diapers, from Rock N Green, to Charlie’s Soap, EcoNuts, and lots more. I personally use Charlie’s Soap, and it seems to work well for us. Some people have had issues with it, my old issue is sometimes the inserts I use feel weird, but this usually happens when I have washed a smaller load. See, I think I sometimes use too much, but I’m not always sure to how measure, and I think that is why others have issues with needing to strip. What is baby eating? I know what the baby eats has a lot to do with what comes out of him as well. Some babies hold water better, some less, some have more concentrated urine than others, my baby almost never has a yellow coloring to his urine, of course, he is 7 months old and mostly just breastfeeding right now, I’m sure in a year or so, it will vary much more. 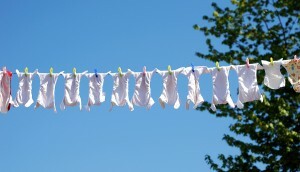 The fun thing about cloth diapering is there are a lot of variables. But, what can I suggest? Of course if you have other signs that something is wrong, stripping happens to be one of the first steps in troubleshooting. So definitely give it a shot. But how do you strip your diapers? Read the instructions for your diapers and wash them correctly, with the appropriate amount of detergent and water, for that diaper. It’s hard to figure out, for sure, but you get a sense quickly as you are washing them a couple of times a week. Contact the manufacturer for your cloth diaper about safe ways to strip their diapers if you have any questions, most will answer on their facebook page or through email. I’ve found many to be very helpful when discussing problems. These are some things I’ve learned to do, to help avoid stripping, just because I’d rather not if I don’t have to. Figure out how much detergent you need to use, based on your average load size, the kind of water you have, the temperature of water that best fits your detergent, the best detergent for your washer, and the best rinse/soak before you wash. It sounds like a lot, but as you wash so often you will notice a pattern and you’ll figure it out. If you have any questions, just send an email. Switch out your absorbent layer often. I have several inserts, and I cycle through them. I keep a few sets that I use, and after each wash I change out what is going to be used for the next cycle. Buy lots of diapers. If you are anything like me, you will love this step, and you can tell your hubby that Everything Cloth said it was necessary. Heck, if you buy a new diaper every couple of weeks you will still save money compared to disposables, and you can sell them down the road. 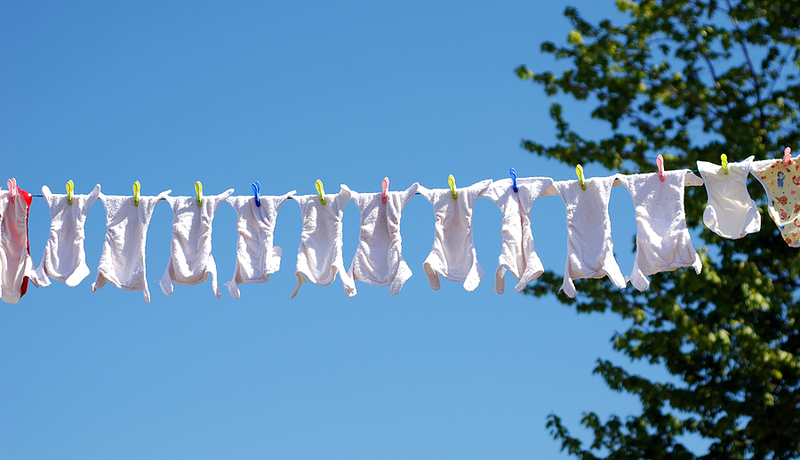 What is your experience with stripping your cloth diapers? What could help others? What is your favorite way of stripping? SHARE with me!! Great post! I haven’t had to strip very often as I have a pretty big collection. But when I do I usually try with several hot water cycles first. If there is still smell/ammonia/decreased absorbency, I go to Funk Rock or Rockin’ Green soak. We have really hard water in Calgary, so I use 1.5 to 2 tablespoons of Rockin’ Green Hard Rock. I am going to give Allen’s Naturally detergent a try very soon as AMP and most of the diaperanufacturers approve of it.